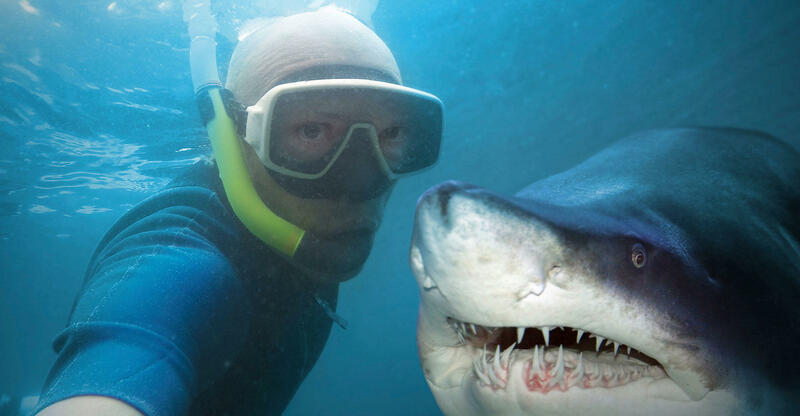 Are Selfies More Deadly than Sharks? Could it be more dangerous to be Kim Kardashian than Andy Casagrande? Probably not -- but some interesting statistics beg to differ. So far this year, Mashable counts 12 selfie-related deaths, the latest of which occurred when a 66-year-old tourist fell down the steps of the Taj Mahal as he attempted to snap a selfie. Meanwhile, there have only been 8 reported shark-related fatalities in 2015. On average, only 6 people die each year following a shark encounter; choking, driving, bathing, and walking down the street are all more deadly than sharks, according to Buzzfeed. Despite years of rhetoric painting sharks as indiscriminate killing machines, experts say that most shark encounters are actually a case of mistaken identity -- not "a large monster intentionally and maliciously targeting humans." "I would say to bathers: don't wear bright-colored bathing suits, especially those that have contrasting colors. Some sharks can see color. Don't wear jewelry. When you're in the ocean and the jewelry moves around, and the sun reflects off of it, it could be interpreted as a fish by some of these smaller sharks and they might come in thinking it's a fish in distress." "And just use common sense. If sharks have been reported in an area, don't go in the water there. Common sense goes a long way with these animals. Never provoke a shark. So don't grab a tail. Don't try to feed them. Don't poke them with anything because you might elicit a response from them that you'll be sorry you got." Ever Puke Your Guts Out … Literally? Here’s Why Sharks Do. How did Michael Phelps’ Swim Cap End Up in Space? What’s Killing Bay Area Sharks by the Hundreds?